This article is part of our series on Craft Cider. See links below for more. George Carlin once looked in his fridge and couldn’t discern the contents of a particularly old plate of food. “Is it meat? Is it cake?” asked the dazed fellow during a standup routine of decades ago. Trust me, it was hilarious in context. Sometimes one runs into two things that seem similar but require completely different treatment. Regarding fermented beverages, there is little confusion between beer and wine; they are the Salt and Pepper of ‘soft alcohol’. Even those who are fans of both will tend to employ them differently. However, a recent increase in popularity has drawn attention to a beverage class that straddles both sides of the beer-wine divide: craft cider. Slotting cider with wine makes sense on a certain level. In terms of fermentable material and production process, cider certainly has a lot in common with vino; it’s not ‘brewed’ (no boiling involved). But in some ways, cider is more like beer than wine. You already know why: it’s a refreshing drink that is commonly served on draught (eg, the ‘good’ old Strongbow tap next to the Guinness) and is widely perceived to be a warm weather beverage (remember, not everyone drinks thick black beers all winter like you do). Wine, on the other hand, is not quaffed by the pint (again, if you beg to differ: I’m just saying that other people use smaller glasses than you). There is a line of thinking, and some research, that says there is a growing cross-over between craft beer and cider consumers, and that producers should have the ability to sell cider in the same fashion as craft brewers do. Case in point: cider is absolutely a candidate for growler sales. Wine? Not so much. It’s hard to put a finger on how to deal with cider, especially in the hospitality space. This summer, Orchard & The Sea came online as BC’s first Craft Cider Bar and kitchen, providing modest but demonstrable evidence of the category’s growth curve. Proprietors Shawn & Kelly Pisio have experimented with serving options. So far, they’ve partially adopted a beer-like approach, offering flights of samples akin to a craft brewery tasting lounge. Groups also have the option to share a bottle at a table, in traditional wine style. Cider is absolutely a candidate for growler sales. Wine? Not so much. Chef James Bryan of Penticton Ramada’s Kettle Valley Station restaurant discussed with us the presentation factor around cider. Many cideries package their product in 500 ml brown bottles, (similar to some UK beer bottles). Others like Summerland Heritage prefer clear wine-style 750 ml bottles for the aesthetic appeal (Howling Moon covers the bases by doing both). There’s a clear difference in perception between the two packages; one looks much more elegant than the other. Proprietor Cameron Bond of Summerland’s Local Lounge + Grill spoke about the issues around trying to present cider as a product at the table. “Having it on tap is an animal, because a lot of people like to drink it with ice.” Staff have to make a point to ask the customer about preference, or use two glasses: one to hold the liquid, and another glass with ice to pour it into. At that rate, one would be tempted to forget draught and stick with bottles. Ice is a factor that makes cider different from both beer and wine. Given how tricky categorizing cider is for both industry folks and the general public, it’s understandable that provincial legislation might not perfectly serve the fledgling craft cider industry. BC’s liquor legislation currently takes a two-tier approach to cider licensing that assesses operators based on their type: farm or factory. 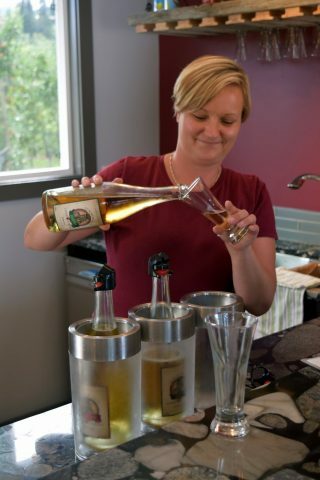 BC has differentiated between wineries in this way for years, and applies the same logic with cider due to its similarity to wine. Basically, if you grow the fruit yourself (vineyard or orchard), you get a “Land-Based’” license. Otherwise, you’re a “Commercial’” manufacturer. The BC Liquor Control & Licensing Board slaps a higher markup on products from commercial operators than on land-based, leading to an intentionally uneven playing field. That’s a good thing, assuming that the ‘commercial’ producers are the classic, larger operators that make what ‘cider’ has meant for the past two generations (fizzy sweet pop in 2L bottles, interchangeable with ‘coolers’). Those businesses are certainly not bothered with caring for small orchards; they’re pumping booze, sugar, flavouring and CO2 into a fermented fruit concentrate in a factory. It makes sense that wine and cider made by those ‘big boys’ should be taxed at a higher tier; that’s what the government does with beer, and you support it because it makes the BC craft beer industry possible. However, maybe we’re not actually comparing apples to apples here. There’s probably no rule that says one can only be a quality craft cidermaker if one operates an orchard. It seems quite possible in theory to set up a skilled fermentation and blending operation using other people’s fruit, including locally produced BC apples. Vancouver’s startup Sunday Cider is a case in point. Following the urban-craft-brewery-style model employed by a number of cideries in US cities like Portland, they aim to use quality fresh materials in their products, without actually growing them. Unfortunately for them, they’re classified in the same bracket as the giant companies, meaning that in order to sell their product at par with farm operations, they have to take a cut in profit. His question makes perfect sense to me now. Long the domain of industrial-scale producers, urban craft cider wasn’t on the radar as a small business issue when any relevant legislative decisions were made. As Hadfield acknowledged, in recent years the BC Government has made great strides in revamping liquor law as it pertains to craft beer, following the lead of other jurisdictions like Oregon. 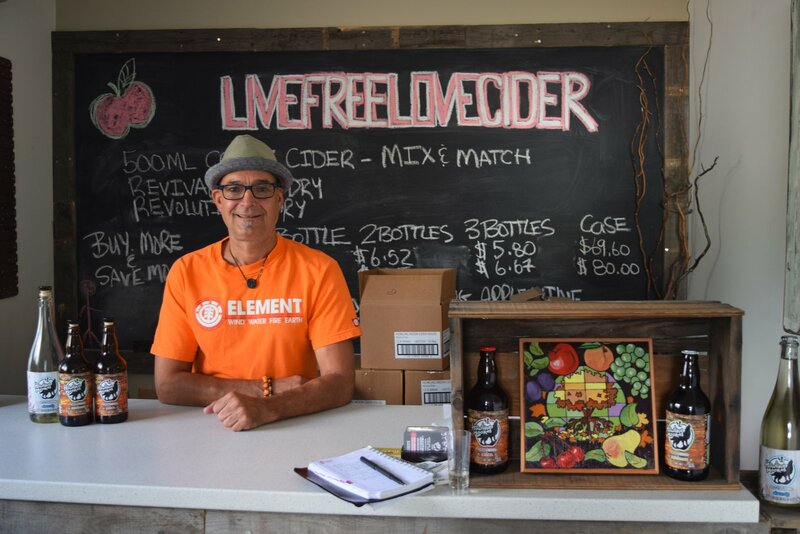 It might be time for the same type of review to take place around craft cider, in order to accommodate a potential new wave of small urban craft-brewery-like operations that might make cider, perry, mead or other fermented beverages from natural materials. Ultimately, urban cideries will likely want to follow the lead of all those breweries you see in Yeast Van, and it might make sense to treat them that way. Back at Orchard & The Sea, Kelly and Shawn, who naturally support both types of BC craft cideries, ventured that a third licensing category might one day be necessary to deal with the trend. vs. little rather than little vs. little. Orchard operators, who would be exposed to unexpected nimble competition if urban cideries suddenly start popping up, will point out that there is a difference in commitment between operating a straight production facility and a full estate cidery. Orchards are a category of farming with a massive startup commitment and a long waiting period before they come to fruition. That’s an investment they wouldn’t want to regret. It sounds like what we need are changes that benefit commercial non-estate cideries without enabling the ‘big boys’ to dominate. As with beer, part of what’s needed is to set a production threshold to separate small urban crafties from the giants. The challenge is to finely adjust the current markup differential so as to enable a small wave of newbies while minimizing risk to the present orchard model. The fight for the future should be big vs. little rather than little vs. little. At What’s Brewing, we’re pulling for both types of small producers–with and without farms–as long as they’re making cider the way it should be. Jeremiah Thunderfoot writes about the business of beer for What's Brewing.